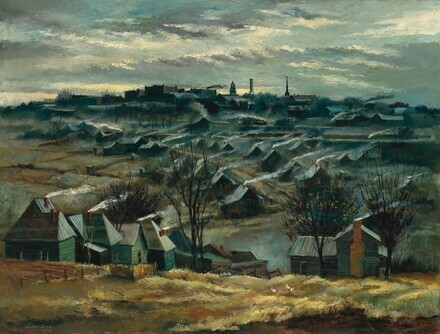 Robert Torchia, “Lamar Dodd/Winter Valley/1944,” American Paintings, 1900–1945, NGA Online Editions, https://purl.org/nga/collection/artobject/52399 (accessed April 21, 2019). “Lamar Dodd: In an Un-Bohemian Way He Sparks an Art Movement in the South,” Life, Sept. 26, 1949, 62. Lamar Dodd to Mary Levin Koch, May 5, 1989, NGA curatorial files. “Dodd: An Athens Portfolio,” Athens 2 (Fall 1970): 23. 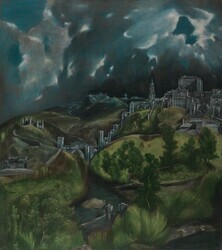 Painted during the Great Depression and World War II, Dodd’s views of Athens and the surrounding countryside are often tinged with a subtle melancholy that matched the somber tenor of the times. Dodd frequently depicted African American communities in the South, and in Winter Valley he has focused on the eastern section of Athens where the majority of the city’s black residents lived near the industrial plants in which they worked. Jerry L. Cain and Donald A. Smith, "The Chambers Column," Athens 2 (Fall 1970): 3. Harry B. Wehle, The Metropolitan Museum of Art: A Catalogue of Italian, Spanish, and Byzantine Paintings (New York, 1940), 231. Nevertheless, a photograph of Dodd sitting on or near the vantage point from which he painted Winter Valley [fig. 2] [fig. 2] John Dominis, Art teacher Lamar Dodd conducting outdoor class, LIFE Magazine, 18167, The LIFE Picture Collection/Getty Images and a map of the city [fig. 3] [fig. 3] Map of Athens from Georgia: A Guide to Its Towns and Countryside (Atlanta, 1940), 2–3 suggest that the view was quite accurate. Gudmund Vigtel, 100 Years of Painting in Georgia (Atlanta, GA), 1992, 40. Anonymous gift 1971 to NGA. Annual Exhibition of Contemporary American Paintings, John Herron Art Institute, Indianapolis, March-April 1944, no. 16. Painting in the United States, 1944, Carnegie Institute, Pittsburgh, October-December 1944, no. 50, repro. Grand Central Art Galleries, New York, 1945. Loan for display with permanent exhibition, Georgia Museum of Art, University of Georgia, Athens, 1945-1970 [except for periods of loan to special exhibitions]. [Lamar Dodd exhibition], travelling exhibition, 1950-1951. Lamar Dodd: A Retrospective Exhibition, High Museum of Art, Atlanta; Georgia Museum of Art, University of Georgia, Athens, 1970-1971, no. 22, repro. Extended loan for use by The Supreme Court of the United States, Washington, D.C., 1972-1973. Extended loan for use by the Speaker of the House, U.S. House of Representatives, Washington, D.C., 1973-1976. Extended loan for use by Secretary Clayton Yeutter, U.S. Department of Agriculture, Washington, D.C., 1989-1991. A Shared Vision: The Life and Art of Lamar Dodd, Lamar Dodd Art Center, LaGrange, Georgia, 1996, no 57. American Light: Selections from the National Gallery of Art, Art Museum of Western Virginia, Roanoke, 1998, no catalogue. The plain-weave fabric support has been lined with wax and remounted on a nonoriginal stretcher. The bottom tacking margin is stamped “PERMALBA PRIMED WEBER CANVAS NO. 2.” The fabric was coated with a thick, smoothly applied, commercially prepared, white ground. The artist applied paint broadly and fluidly, wet into wet, with a brush or a palette knife, so a great deal of texture is evident throughout most of the painting. In contrast, the final layers of paint—which define the trees and the fence—were applied with fine, controlled brushwork wet over dry. Although the surface reveals impasto lying below the visible paint surface, suggesting the artist’s changes, neither the X-radiograph nor the infrared examination identified anything specific. The paint layer is in good condition, with minor losses and some crackle because of the thick paint. There is a small loss at the left edge of the painting that may have been repainted by the artist, because the paint is consistent with the area surrounding it. The surface is coated with a thin layer of natural resin varnish. The appearance of the painting is marred by wax residue that was caught in the interstices of the paint layer during the lining process. "Dodd: An Athens Portfolio." Athens 2, no. 4 (Fall 1970): 23, repro. Elsen, Patricia, ed. "College Museum Notes." Art Journal 31, no. 1 (1971): 85, repro. American Paintings: An Illustrated Catalogue. National Gallery of Art, Washington, 1980: 143, repro. American Paintings: An Illustrated Catalogue. National Gallery of Art, Washington, 1992: 159, repro. Thomas, Frances Taliaferro. A Portrait of Historic Athens and Clarke County. Athens, GA, 1992: 190-191, repro. Vigtel, Gudmund. 100 Years of Painting in Georgia. Atlanta, 1992: 40, repro. 41. Lamar Dodd, “The Truth in Things,” Magazine of Art, Mar. 1942, 104. Lamar Dodd to J. Carter Brown, Dec. 29, 1970, NGA curatorial files. A View of Athens was reproduced as a full-page color illustration in “Lamar Dodd,” Life, Sept. 26, 1949, 64–65. It had also been illustrated in Maude Riley, “Carnegie Institute Opens Exciting Survey of American Painting,” Art Digest 19 (Oct. 15, 1944): 7, and Howard Thomas, “Lamar Dodd, Southern Painter,” American Artist 10 (Feb. 1946): 12. Georgia: A Guide to Its Towns and Countryside (Athens, GA, 1940), 147. For a discussion of Dodd’s interest in Henri and The Eight, see William U. Eiland, The Truth of Things: The Life and Career of Lamar Dodd (Athens, GA, 1996), 13–20. Harry B. Wehle, The Metropolitan Museum of Art: A Catalogue of Italian, Spanish, and Byzantine Paintings (New York, 1940), 231.